Mol is a small town in the Belgian province of Antwerp, known among golf enthusiasts for the immense club that stretches over 47 hectares. Among the most renowned in Belgium, the Kempense Golf club boasts an 18-hole course surrounded by dense vegetation, with mixed routes, practice areas, golf shops and a nice brasserie. KE Boflex retailer has been contacted by the new club owners to renovate the outdoor area of the brasserie, in order to make the most of it in any season. The owners’ need was to create a covered area that would extend the seating of the venue and that was both elegant, functional and in keeping with the essential architectural style of the brasserie. The choice was Gennius Isola 2 pergola, composed of 3 modules side by side, in black inver colour with roofs in white Ferrari darkening fabric. Isola 2 stands out for its minimal lines and low-arched roof that guarantees minimum overall dimensions. 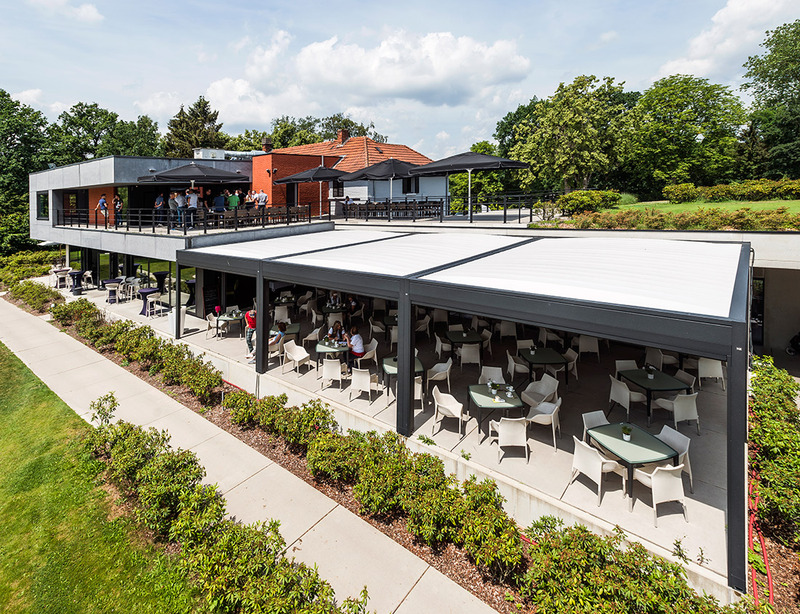 After the installation of the three Isola 2 pergolas, the brasserie gained around 80 new seats. In case of bad weather, the structures can be closed thanks to the Gennius Vertika system of side rollers. An LED strip has been added along the entire internal perimeter of the structures creating the right evening atmosphere – perfect for those players who want to relax after a day on the green.